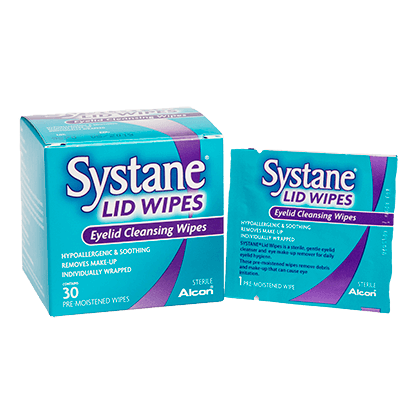 Developed by leading manufacturers Alcon & Ciba Vision, premium Systane Lid Wipes are perfect to use for your everyday hygiene; as a cleanser, for irritable eyes and to remove eye make-up. Systane Lid Wipes are gentle wipes that can be used as part of your daily routine and are generally recommended by your opticians. They are hypoallergenic, with each wipe sterile and packaged individually. Each wipe needs to be rubbed to develop a lather before opening. Simply close your eye, wipe your eyelid with the lid wipe then rinse and dry the area around your eye after. The box contains 30 pre-moistened wipes, each in a separate airtight sachet. Systane Lid Wipes can be used while you’re wearing contact lenses, however are not suitable for children. For a wide range of eye care products, browse our range at FeelGoodContacts.ie. For any questions you may have, please don’t hesitate to contact our dedicated customer service team.